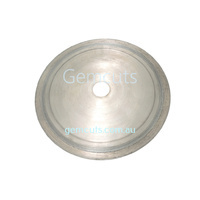 These lapidary saw blades are steel, with diamond in the outer rim. The strength of steel gives you a thin kerf (thickness of cut) so you don't waste a lot of precious material. The blades will rust if left standing in water for an extended period of time. If you choose to leave your blades in water over night we recommend adding a rust inhibitor to your water. Always use appropriate safety equipment such as eye, ear and breathing protection when sawing. Also check out our guide to safe operating speeds for saw blades by clicking here. - Your machine size. What size diamond blade will it accept? - The size of the arbor (shaft) on your machine. We will provide one free saw blade bush to fit. Arbor sizes are usually imperial 1/2", 3/4", 5/8", 7/8" or 1". Postage costs for these diamond saw blades are calculated based on weight and will be shown at Checkout before you finalise your purchase.